Founded in 1851, Santa Clara University (SCU) is a top-ranking private university located in Santa Clara, CA with roughly 5,385 enrolled undergraduates. Lucas Hall, SCU’s School of Business building, was originally built in 2008 and needed a refresh to meet the current demand for remote learning and lecture recording that modern students and professors rely on. As such, the university tasked Avidex, a leading audiovisual and technology integration company, to identify a new microphone array for recording lectures, leading them to Shure’s Microflex Advance array solutions. The Shure Microflex Advance MXA910 Ceiling Array microphones are currently being leveraged in 12 classrooms and one multipurpose room in SCU’s Lucas Hall. The MXA910s are networked array microphones that capture audio with Shure proprietary Steerable Coverage technology, enabling up to eight lobes that are configurable in three dimensions. This technology is especially useful for large classroom and multipurpose environments, as microphones do not need to be constantly moved to pick up the best possible audio, and can be easily altered to meet new audio needs in the classroom. 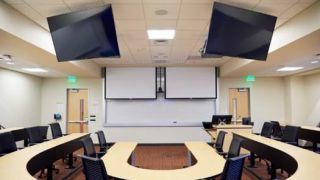 With Microflex Advance, two ceiling array microphones cover an entire lecture hall or multipurpose room, removing the requirement to equip lecturers and lecture halls with microphones before class or an event. The university also uses the microphone arrays gating to trigger camera presets that direct the camera to the location of the presenter. This solution provides an enhanced experience for students and teachers alike. There is nothing lecturers need to know before starting class, as they simply come in and teach, giving them the ability to focus on the lesson plan instead of worrying about setting up the AV technology.